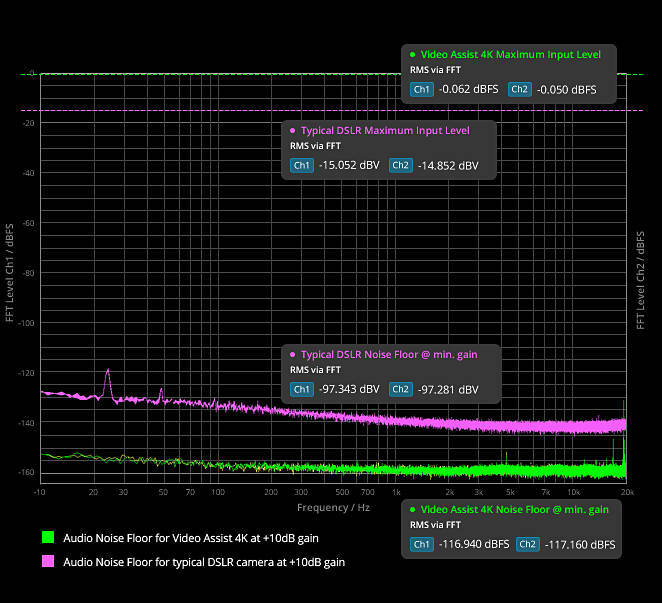 10-bit 4:2:2 HD ProRes or DNxHD recording. -128dBV noise floor for high quality audio recording. LANC connection for remote control. Auto start/stop recording using HDMI or SDI triggers. Includes slots for 2 hot pluggable batteries as well as 12V DC power input. Full compatibility with editing software such as DaVinci Resolve, Final Cut Pro X, Avid and Premier Pro. All in one design, mount to cameras, hold in your hand or set up on a table with the included kickstand. Includes 6G-SDI input allowing it to be used as an Ultra HD monitor. Blackmagic Design today announced Blackmagic Video Assist 4K, a portable all in one professional monitor and video recorder that can be used to add professional recording and monitoring to any SDI or HDMI camera. Blackmagic Video Assist 4K features a bright, high resolution 7 inch monitor for checking focus and framing, two high speed recorders for non-stop HD and Ultra HD recording, two extremely high quality XLR microphone inputs for professional audio recording, a built in speaker and more. The Blackmagic Video Assist 4K is perfect for customers that need better monitoring and higher quality recording. Older cameras often feature custom and hard to use file or tape formats, while lower cost consumer cameras often have poor quality file formats and small screens, limiting their professional use. Blackmagic Video Assist 4K solves this problem because it works with every type of camera from DSLRs to older tape based camcorders, and even the latest digital film cameras. Blackmagic Video Assist 4K features two built in high speed UHS-II recorders that work with the latest high performance SD cards, making them fast enough to record Ultra HD video up to 2160p30 on widely available, inexpensive SD cards. Files are saved as broadcast quality 10-bit 4:2:2 video in either ProRes or DNxHD formats, making them compatible with all popular editing software, like DaVinci Resolve, so you can start editing immediately without having to transcode or convert files. Recording can be triggered to start and stop using LANC or over HDMI or SDI from the camera. With two built in recorders, customers get non-stop recording because when one card is full it automatically continues onto the next. The new high speed SD cards are compatible with existing SD card readers so they can be mounted directly on a computer for cloning and backup using the included DaVinci Resolve software. Blackmagic Video Assist 4K is also an extremely high quality audio recorder that features two mini XLR inputs with 48V of phantom power so customers can attach external microphones. This totally eliminates the problems with auto gain controls on DLSR cameras and, with an amazing low electrical noise floor of -128dBV, the recordings are incredibly high quality and sound dramatically better than camera audio. Sound is recorded into the same file as the video, so customers don’t have to worry about AV sync between separate audio and video files! Durable and lightweight, the Blackmagic Video Assist 4K features a bright, 7 inch high resolution 1920 x 1200 monitor and touchscreen with a wide 135º viewing angle. The extra resolution of the screen lets customers view 16:9 sources and see critical status information without covering the image. The display is also a touchscreen that lets customers use simple tap and swipe gestures to display camera information, change settings and evaluate audio and video levels. Blackmagic Video Assist 4K features an elegant heads up display overlay that lets customers keep their eyes on the shot while viewing the current input frame rate, histogram, audio meters, timecode and more. For power, Blackmagic Video Assist 4K features two standard LP-E6 battery slots that allow hot swapping of batteries while in use, and it can be powered using the 12V DC input. The batteries are discharged serially, so only 1 is used at a time. When there’s power, the batteries are charged in parallel, which saves time when recharging. I think that's the least expensive 4k external recorder available at the moment! Yes, it just make little point for most. As all major 4K products coming will work with 60fps HDR footage. It will be great for recording v-log with the GH4 at a relatively low price... but yeah, wondering if the GH5 will have 10 bit internal recording along with lots of "HDR-Ready" stickers on the box at Photokina. Looks amazing: the recording to 10-bit to SDHC cards is a HUGE plus. Only concern I have is whether it supports applying LUTs for previews. This is will go perfectly with the GH4 true 10Bit ProRes files. Not without LUTs, it won't. Vitaliy, the name of this item is the Blackmagic Video Assist 4K. Can you please change the topic title to match? "Looks amazing: the recording to 10-bit to SDHC cards is a HUGE plus. Only concern I have is whether it supports applying LUTs for previews." In the interview video I checked out the BMD guy said "not yet", but it is something they're actively looking to add, just they don't know if they can just yet or not. They're adding LUT support to the Ursa Mini in firmware v4.0 this summer. Not sure if that adds any weight to the prospect of seeing it in the VA 4K this year (or ever). If this had LUT support and custom anamorphic unstretch I would be all over it. From what he told me, which would all be "speculation"
I asked him about LUTS and he said "Wouldn't it be cool if you could load them in the flash memory, and have up to 6 to choose from." More tools such as false color, vector scope, are a possibility. he said just like the 5" Video Assist, from what it's initial release, it will look like a different monitor late this summer with firmware upgrade. All "speculative" from his mouth. does it have focus peaking? @Vitaliy_Kiselev HDR footage? What do you mean by this, and why does it require a special recorder? HDR footage? What do you mean by this, and why does it require a special recorder? I mean that we are in early non standardized age. Consumer/hybrid cameras will be using 4kp60 with HEVC, may be with intraframe option also. HDMI output will use latest additions, same as players will use with HDR output to TVs. Do you mean like the HDR panasonic camcorders? I still dont understand why you need a special output for this. Do you have some reference? I am also very interested in this product. I like the usage of SD cards, (dual) and dual batteries. Now all we need is LUT support and they can take my money. It does not record 4k. Uhd 2160p only per specs. Blackmagic Design today announced the immediate availability of Blackmagic Video Assist 2.4 update which adds support for multi-lingual support for 10 separate languages. This means customers can now use Video Assist in their native language. This update is available now as a free update for all Blackmagic Video Assist and Blackmagic Video Assist 4K customers. 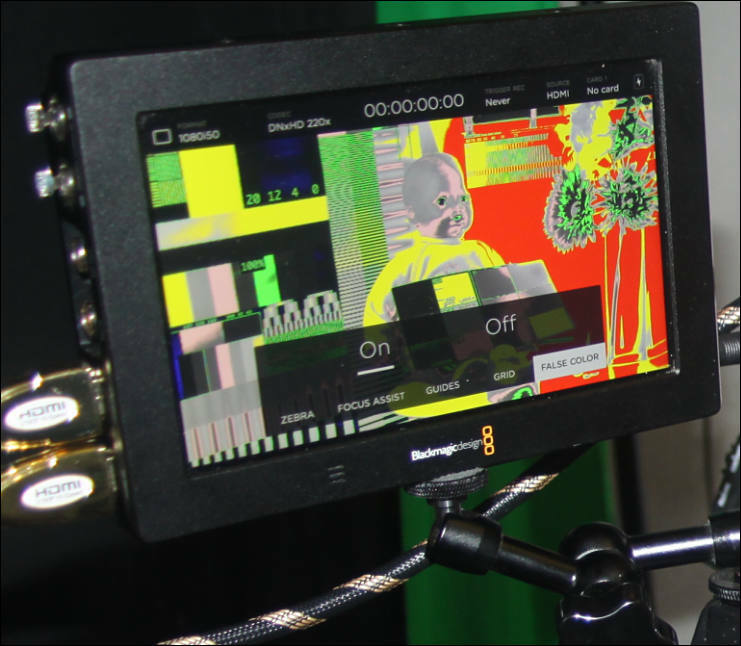 Also demonstrated at the NAB 2017 show are powerful new professional scopes operating on the Blackmagic Video Assist 4K model, including waveform, RGB parade, vectorscope and histogram that can be viewed full screen for accurately evaluating video signals passing through Blackmagic Video Assist 4K. These scopes are shown as a development preview and will also be available in June as a software update free of charge for all Blackmagic Video Assist 4K customers. Customers can see a beta demonstration of the new language support and preview the new professional scopes on Blackmagic Video Assist 4K at the Blackmagic Design NAB 2017 booth at #SL216. The new scopes make the Blackmagic Video Assist 4K model perfect for live production monitoring, as portable test scope for broadcasters, and even for balancing color when color grading using the RGB parade scope. The new localized Video Assist adds interface support for Chinese, English, French, German, Italian, Japanese, Korean, Portuguese, Russian, Spanish and Turkish. This broad language support now makes it easier for more customers to use Video Assist anywhere in the world. Blackmagic Video Assist 2.4 update is available now from the Blackmagic Design website free of charge for all current Blackmagic Video Assist and Blackmagic Video Assist 4K customers. Blackmagic Video Assist 2.5, which will support scopes on the Blackmagic Video Assist 4K model will be available in June.